The rent at Stoneleigh Apartments ranges from $878 for a one bedroom to a $1,051 two bedroom. Apartments in this building are about 1% less expensive than the South Side average. This is a pet-friendly apartment. This apartment is in the South Side neighborhood in Corpus Christi. Nearby parks include Glen Arbor Park, Candlewood Park and Ridgewood Park. 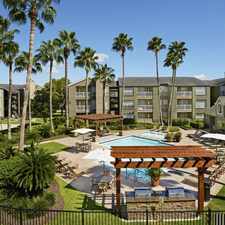 Stoneleigh Apartments has a Walk Score of 59 out of 100. This location is Somewhat Walkable so some errands can be accomplished on foot. Please note that pricing shown is only base pricing, which does not include utilities., please call for more details. An exclusive, tranquil gated community of upscale apartment homes amidst tropical landscaping, Stoneleigh Corpus Christi was planned to ensure your comfort and privacy. Appointed with the essential qualities for gracious living, the community offers creative designs with richly- appointed amenities and a caring, professional staff ready to make your apartment community a true home. More than a place to live....we offer a lifestyle. Explore how far you can travel by car, bus, bike and foot from Stoneleigh Apartments. Stoneleigh Apartments has some transit which means a few nearby public transportation options. Car sharing is available from RelayRides. Stoneleigh Apartments is in the South Side neighborhood. South Side is the 3rd most walkable neighborhood in Corpus Christi with a neighborhood Walk Score of 37.